An intensified olfactory experience, Gucci Guilty Intense adds a twist to Gucci Guilty, making it more provocative and more sensual. Guilty Intense is a warm yet striking oriental floral, which opens to a natural rush that is mandarin - imbued with a modish transparency, shimmering alongside an audacious fist of pink pepper. The middle notes and floral signature of the lilac flower have been enriched with violet accents and made even more feminine with hints of powdery notes. Intensifying the alluring concoction of heady lilac and geranium gives Guilty Intense the vibrant burst of peach resulting in a feminine eau de parfum. The base of addictive patchouli and the unique ambery dry down have been greatly enhanced for a darker and more provocative trail. A flanker to the original Gucci Guilty, the packaging design is an enhanced, more opulent version of the original gold packaging. The original's muted metallic casing has been transformed into a richer, more opulent gold, its precious amber juice becoming bolder and darker. The sleek fusion of bolder gold metal and smoky grey glass, the signature interlocking Gs a window onto a delicate amber juice; the flacon will prove as covetable an accessory as the latest Gucci bag. The perfume bottle in the photos is a small bottle, part of a coffret, and the packaging is different from the predominantly gold regular-sized spray bottle. Notes: Mandarin, Pink Pepper, Peach, Lilac, Geranium, Ambery Notes, Patchouli. Guilty Intense is a perfect winter's day perfume. A spicy floral with notes of patchouli and amber, this definitely won't be the first pick for anyone with a sensitive nose. Despite being quite intense, Gucci Guilty Intense is a very grown-up rounded fragrance. The initial notes, immediately as I dab it on, are a bit sharp but settle down quite fast into a spicy floral with hints of sweetness from the violet. The base notes of patchouli and amber soon float up adding a warmth and muskiness to the fragrance. I love to add a few drops to my wrist, and that gives a much subtler, lingering effect to this perfume. The perfume, despite being quite strong, doesn't really last the whole day on me, fading off by about 3 hours but never quite disappearing. I would keep Gucci Guilty Intense for cooler winter days, but used sparingly, I think it would work just as well any time of the year - and of course, this would make a great evening/night time perfume. I haven't tried the original Gucci Guilty yet to compare this to, but I seem to love amber-patchouli bases and spicy fragrances, and Gucci Intense is definitely one of my favorites. Darker nails, much like darker lipsticks make an appearance every year around the fall/winter season. For a really long time, though, I won't even look at a darker nail colour. I had tried a couple of plums and berries, and they just looked terribly dated and aging on my hands. I would never have bothered going beyond the "safe" neutrals if not for a Lakme black nail polish I picked up instead of a liquid eyeliner. I loved it, and I have been hooked to the dark nail trend ever since. Black might not be everyone's first pick when it comes to a darker nail, but for a similar effect without the goth factor, a "vampy" shade would be just right. From the deep, dark, reddish-browns, burgundy, and plums to purples, browns, and even black, I lump just every dark, almost-black nail polish into this category. Done right, I think vampy nails can look quite classic, and doing it right definitely isn't rocket science. Start with scrubbed, clean well-moisturized hands and follow these basic steps. 1. Don't skip the base coat...or the top coat. Base coats are a good idea with any nail polish, but this gets more important with the darker colors as they tend to discolor nails faster. Also, because even the teeniest chip is so much more obvious on that fabulous dark nail polish, optional but definitely a good idea is also following up with a top coat. Wait for the base coat to dry completely before applying the nail polish to get the best finish. Most times, I need at least 2 coats of a darker polish to get a good finish, and I apply each coat in thin layers and allow it to dry completely before adding on the next coat - and that's a safe rule to follow for all polishes! Wait for the polish to dry completely and then finish off with a glossy, chip-resistant top coat. I know I said a lot of "waits," and the next rule is just that! 2. WAIT...some more! Darker polishes tend to be thicker and dry slower, so if you want a perfect manicure, ensure that you have at least 20 minutes (to an hour) set aside where you won't be opening clutches and chopping fruits...or sleeping. I have lost count of how many times I have woken up with "textured" nails! The only thing that works for me is to find a nice book and get reading - won't notice the time go by and I don't run the risk of ruining the wet polish. Listening to music would work too - I tend to fall asleep that way, though, and we are back to the "textured nails" :P Basically, stay hands-free for a good portion of an hour to keep your polish looking glossy and smooth. 3. Keep it short and keep it clean. This last one is sort of my personal preference. I like to keep my nails short if I am sporting a darker nail color (okay, honestly, I like to keep them short all the time :P). Recommended nail length: About a 1/4 inch past the finger tip. To avoid making the nail looks too stubby, keep the edges more rounded rather than a square tip. Again, that's just my preference, but if you like longer nails and feel they look fabulous with that dark polish, go ahead! Since dark polishes are so awfully difficult to get off and tend to stain the skin edges around the nails so easily, I leave a teeny tiny bit of gap all around the edge as I apply the nail polish. Another tip for cleaner edges, run a thin brush dipped in an acetone-based nail polish remover along the edges to clean up. That's it - just 3 simple rules (if you can call them rules) that really make pulling off that vampy nail polish so much easier. As for my current favorite dark nail polishes - last year it was all darker grey/black nails with an occasional dark purple, but this year is all about deep dark plums, berries, and variations on the oddly named but oh-so-popular oxblood. I tried a whole lot of Chanel nail polishes this year, starting with a lot of brighter/pastel shades and ending the year with some lovely dark ones. Malice and Rouge Noir would definitely be my top picks for a perfect vampy nail, but every nail polish brand has at least a couple of lovely "vampies", so there is sure to be a color for everyone! What about you - do you switch over to darker nails in the colder weather or do you prefer neutrals? What's your favorite vampy shade? Do share! Bold colour combines with the smoothest, silkiest gel texture for luxurious wear and deeply dramatic effect. Lips feel comfortable—never sticky or tacky—and look luminous, full and sensuous for hours. The double-sided, flocked applicator is beveled to deliver ultra-precise definition. Shades featured in the Printemps Precieux de Chanel Collection are Merveille and Attirance. Described as a lilac rosewood, Merveille is one of the two Rouge Allure Extrait de Gloss released as part of the Printemps Precieux de Chanel Spring 2013 makeup collection. The formula is very typical of the Rouge Extrait line - a thicker lipgloss with an almost colour payoff and a longer-lasting formula than regular lipglosses. Merveille has very fine shimmer mixed in which adds to the shine factor (no shimmery glittery effect here - just an enhanced gloss). The double-sided flocked applicator does make it a breeze to apply, though I just prefer using a lip brush to apply this to keep it cleaner. On me, I get more of the lilac-mauve shade than the rosewood. I took a whole lot of photos because this seems different from a couple of swatches I have seen online, but it is how it looks on me and in the photos! Anyway, moving on, the shimmer and the lilac base make this a slightly milky looking gloss on my lips. It is quite opaque for a lipgloss and does quite well on its own, but I think I would prefer this on a darker base - like the Chanel Rouge Allure in Envoutante. Here's a look at the swatch and how it looks on me. I don't find this a very unique shade - Attirance might have been a better choice in that regard - but this is definitely a good choice if you like subtle mauve-pink shades. The lipgloss itself is nondrying and does stay around much longer than regular lipglosses. I prefer using this over a darker base - either a lipliner or a lipstick - to avoid looking too washed out. MAC Pressed Pigments Makeup Collection (available here) - Gorgeous eyes, from sheer and ethereal for day to intense and illuminating for evening. Shadows in complementary tones offer pigmented effects for a season of creative colour play. 12 stunning shades spotlight the eyes making them glow with brilliant accents. P.S: I don't use MAC foundation, but I have been told my skin would fall in the NC45 range. Links have been provided for information only and are NOT affiliate links. Also included in the MAC Apres Chic makeup collection are 2 brushes - 287 Duo Fibre Eyeshadow Brush and 187 Duo Fibre Brush. P.S: I don't use MAC Foundations, but I have been told I would fall somewhere in the NC45 range. Links have been provided for information only and are NOT affiliate links. This unique powder blusher imparts a flattering radiance to cheeks. Remarkably silky texture for easy application and subtle shading. Accentuate cheekbones for a youthful look. Softer tones around the eyes soften expression and rejuvenate. 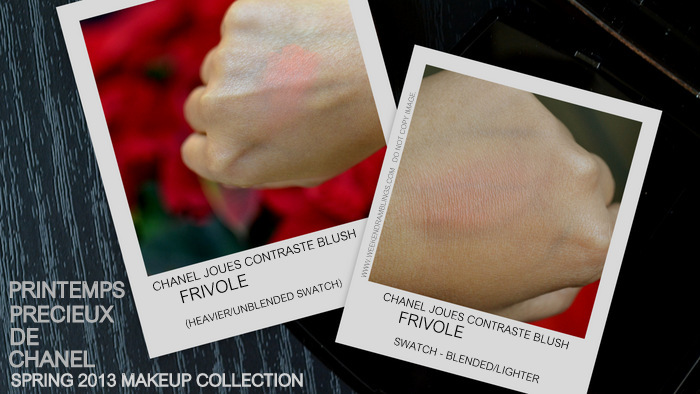 The shade Frivole is part of the Printemps Precieux de Chanel Collection for spring 2013. The newest Chanel Joues Contraste blush Frivole is a bright-ish orangey-apricot blush, and unlike the other Chanel blushes I have tried so far, this seems mostly matte - well, completely matte to me, but I have read reviews stating there is some shimmer somewhere. The packaging is the usual black compact with a small brush included. Depending on the light, Frivole looks almost orangey to a paler apricot in the pan. On swatches, the colour is incredibly easy to blend - I still haven't found the shimmer - and the color looks is a soft apricot-peach combination on my skin tone. The blush is pigmented, but the colour itself is not too bright and the overall effect is quite subtle on my skin. I can build up the colour, if I want to, but it stays soft rather than a brighter, intense orange that I was expecting it to be. To me, this is definitely a spring-time blush - the subtle flush of peach won't be my first pick for the December weather. On the bright side, the lack of shimmer means it pairs beautifully with the Poudre Signee de Chanel Illuminating powder to give a fabulous glow. For lighter skin tones, I think this would be an easy way to wear peach/orange shades that get popular every year around spring and summer. Maybelline Expert Eyes Oil-Free Eye Makeup Remover - This 100% oil-free formula gently and effectively removes washable mascara and eye makeup without oily residue. For best results, slightly moisten a cotton ball or tissue with the remover. Gently press and hold for several seconds against your closed eyelid. Gently wipe off. Rinse eye area with water. Wait five seconds then wipe with tissue. The Maybelline Expert Eyes 100% Oil-Free Eye Makeup Remover hopped into my shopping basket on a random Target trip some time back. I rarely, if ever, use waterproof makeup, so something mild like this claims to be is quite sufficient for my needs. Plus, it's inexpensively priced at about $4. Using this is fairly easy - as directed, dispense on to cotton rounds and use to wipe off any eye makeup. I always follow this with a face wash - my eyes get irritated quite easily and at the slightest excuse, so I prefer not to depend solely on a makeup remover for getting every bit of eye makeup out. I find this quite a gentle eye makeup remover - good in terms of not irritating my eyes with use - but it does take a bit of an extra effort to remove some of the more stubborn bits of makeup such as mascara or eyeliner, and as I mentioned earlier, I don't even use waterproof makeup. It does remove all my eye makeup but does take a teeny bit longer than some of the other makeup removers I have tried. I almost always use kohl liners and generous amounts of mascara, so I would prefer something a stronger. Being oil-free, the Maybelline Expert Eyes Oil-Free Makeup Remover should be good for those who have issues with the film that oil-based removers can sometimes leave behind in the eyes, and if you use very light eye makeup, this might suit you just fine. Five juicy shades of Chubby Stick Moisturizing Lip Colour Balm in a smile-worthy set. Give lips mouth-watering moisture and a hint of soft shine. Five shades of award-winning Chubby Stick Moisturizing Lip Colour Balm are just what dry, delicate lips need to feel comfortably soft and smooth. This set features a beautiful range of bestselling shades to take you through the holiday season and beyond. Shades included in the set: 5 x 0.04 oz Chubby Stick Moisturizing Lip Colour Balm in Oversized Orange, Curvy Candy, Richer Raisin, Chunky Cherry, Super Strawberry. Clinique Chubby Sticks have been around for a long time now. Cute packaging (and name), moisturizing lip balm-like effect, and a sheer wash of colour have made the Chubbies quite popular. I hadn't gotten around to trying them, though, and the Clinique Whole Lotta Colour Set seemed like a fun way to try out a bunch of Chubby Sticks. These aren't the newer Intense version, are the regular/older versions and quite sheer in terms of pigmentation. On my pigmented lips the darkest shade - Richer Raisin (review here) - shows up the best, but if you have moderate to no uneven pigmentation on your lips, these would give a lovely wash of colour. Scroll on for more photos and swatches. Shades Included: 5 x 0.04 oz Chubby Stick Moisturizing Lip Colour Balm in Oversized Orange, Super Strawberry, Curvy Candy, Richer Raisin, and Chunky Cherry. (L to R): Chunky Cherry, Richer Raisin, Curvy Candy, Super Strawberry, and Oversized Orange. I find these Chubby Sticks absolutely adorable, and they keep my lips from getting dry even in this winter air. While the colour payoff is almost negligible on my pigmented lips, I still like to use them under a drier lipstick of a similar shade or over it once the lipstick starts to fade off. Do give these a try, especially if you like sheerer lip colour and/or don't have very pigmented lips. For anyone curious about it, Clinique's regular full-size Chubby Sticks are 0.1 oz and cost $16. The Chubby Sticks included in this set are about half the size at 0.04 oz, but there are 5 colours to try out, and I personally prefer smaller-sized makeup. Plus, the packaging makes this a nice pick for gifting!